The Gates Foundation came out with a report this morning admitting that their heavy-handed, and expensive, focus on teacher evaluation was a failure. 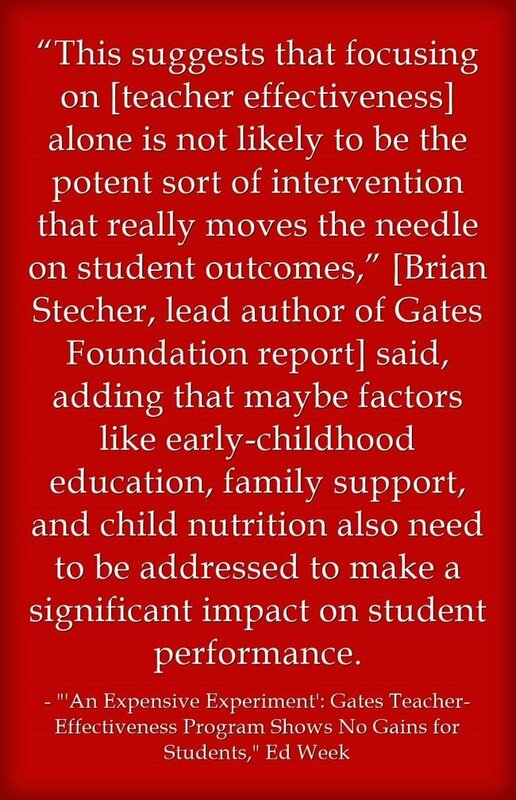 The report’s authors suggest that maybe other factors were more important for students which, of course, just about any teacher could have told Gates before the money was spent (see The Best Places To Learn What Impact A Teacher (& Outside Factors) Have On Student Achievement). I guess the Foundation knew this report was coming earlier this year when they said they were going to end their funding of teacher evaluation efforts (see Gates Say They’ll Focus More On Poverty Alleviation – That’s Better For Everybody!). But it doesn’t give me much confidence in their Big New Thing (see Uh Oh – Bill Gates Has A New Big Ed Idea). ‘An Expensive Experiment’: Gates Teacher-Effectiveness Program Shows No Gains for Students is from Ed Week. The Gates Foundation bet big on teacher evaluation. The report it commissioned explains how those efforts fell short. is from Chalkbeat. I’m adding this info to The Best Resources For Learning About The Role Of Private Foundations In Education Policy. Perhaps those who know nothing about education should be asking those who have lived and worked in education what they see as obstacles to problems instead of assuming wealth from their lofty perch grants them special insight mere mortals cannot understand. Make America Great by investing in preschool education focused on literacy related skills, stop testing every twenty minutes, ask why Pearson thinks they know so much, support families in need, make schools safe, or—-read a book. That money could have generated some powerful preschool programs or helped raise the salary of teachers who are so poorly paid. What a waste! Dr. Paul Patterson…Your litany of suggestions is so well stated!!! Thank you! An excellent comment! Well expressed. Bill Gates should have spoken to you first and saved the foundation money to apply it to your suggestions! I wouldn’t say pre-school but I agree with everything else. How about just letting kids be kids! Let them play, explore, be outside, imagine…being in a classroom all day long stifles children and their sense of adventure. Just let them be children. It amazes me that extremely smart people can be so clueless. I am a teacher so I see how unimaginative students are by the time they get to high school. It’s astounding how many of them can’t think outside of the box, problem solve, analyze or even synthesize, let alone read and write with comprehension. There are bigger problems than the teachers in the classrooms. In fact, I would tell Gates that he’s a dummy to think that everything in the classroom depends on the teacher. It does not take a genius or millions of dollars to see how a child’s home environment, socio-economic situation, culture, health and nurturing impact their abilities at school. He only had to ask teachers to get this information. It’s ironic how teachers are so undervalued and are treated as though they are stupid and yet, they are trusted with educating each generation. 🙄🙄🙄🙄 It’s ridiculous. Have you checked out preschool lately? Research is proving that kids that attend preschool are better prepared for school. After teaching 24 years of special education in middle and high school, I transferred to preschool. Our students do all the things that you indicate that children should do. In reality, I have never worked harder to give kids a head start in education. At the age of 3, we can see what the student needs help with and focus on those skills. Preschool is valuable and worth every cent that they invest into the program. I Have been teaching grade 4 for 23 years and i agree with your observations about students becoming less creative and having done little “free” play. Most students need to be told exactly what to do and how to do it; they have difficulty thinking of ways to approach a problem. I couldn’t agree more. As an employer it’s so frustrating to hire a seemingly intelligent person, a college student, that has no idea how to put a pizza box together, or the ability to figure it out without instruction. Oh my goodness, I agree wholeheartedly. I am an art teacher and I cannot tell you how sad it is that kids sit still all day until they reach art, music, or PE. Small children (and older kids) are not meant to sit for six hours straight and still be productive. My kids do amazing art, yet fellow teachers question the fact that I allow them to TALK and MOVE. Sarah, too often preschool is the only exposure young kids get to toys, books, and even play. Preschool shouldn’t be a classroom. It should be an adventure. Well said!! Thank you! But unfortunately preschool does need to be included because so many children in cases of poverty, neglect, etc. don’t ever get the chance to just “be kids.” Well trained and organized preschools would give children a place to explore, imagine, create, play, and learn important social skills in a safe environment. How sad that so many little ones need to go to preschool to get a chance to just be a kid. No matter the number of formative or summative assessments, until we can address the problems that hinder their ability to learn, even the best teachers will “under perform” based on their student testing results and receive bad evaluations because teachers “expect too much” from them. Agreed! However thee is one thing not mentioned here – home environment. I do see the “support families in need.” I have always believed that in order to eliminate the achievement gap, we need to help parents know how to better support their children’s educations. Too many are overwhelmed by all they are facing. Thank you do much. I get so tired of hearing that underachievers are the fault of the parents. But no one ever addresses the fact that those parents may simply not have to tools to help their children. That is especially true in areas where English is not the primary language spoken in the home. Dr. Patterson is spot on but who is listening. Too much money to be made their way. Sad. Well stated! The next thing that needs addressed is over testing!! Students are having test after test at the end of the semester. And then tell School Corporations to apply the “same” practice instead of relying on a non-educational organizations to mold administrations minds. Dr. Paul, your right on!! We are failing in our schools because we’ve made education a “business” priority instead of a “teaching” priority. What a waste of money. What really is sad, is in order to practice your “Make a America Great Again” ideas, is that it takes HARD work, it takes A LOT OF THOUGHT, and MOSTLY….an INVESTMENT into our kids to do this. Oh wait a minute, that’s a teacher isn’t it. Just wish those who call the shots would realize that. It’s a tough sell. What a great comment! Couldn’t agree more! How much are teachers supposed to make? You have written what we, the teachers in the classrooms, have been saying for years. Thank you Dr. Patterson. Get the kids off of the video games would be a wonderful first step, but that wouldn’t serve Gates well. Closing our borders so that our schools weren’t flooded with non-English speaking children would be the next step. Getting the Federal government out of the education business and sending control of education back to the states and local districts would be the third! We can’t save the world, but maybe we can save our own children if we can get education out of the hands of the Common Core folks who only do this for profit. Also, study about how Bill Ayers was a big part of destroying education from within which was a part of the Communist Manifesto. Well said Mr. Patterson… spot on. It’s akso a shame/ sham that many university educators preparing prospective teachers have little or no current real world experience… there’s no substitute for “boots on the ground” real world prep …no one ever considers or consults the successful classroom practitioner … ideas are cooked up in a lab and put out there with little or no real connection to what’s actually happening in the classroom. Of course. All so true. Well said, Paul. Hindsight is a wonderful thing. Especially when it’s someone else’s money. Bill Gates strikes me as a genuine guy. He earned the $$ and had a right to experiment with it. Thank you, from a Georgia high school teacher, for sharing this. Of course, now that Gates got this corporate ball rolling, it will take many years to stop it. A lot of test publishers have made a lot of money off his “good” idea. They won’t want the gravy train to stop. The ineffable cannot be measured. Teachers are EXPERTS on the ineffable matters of the mind and soul, and NO ONE should tamper with that sacredness! Interesting. A lot of emphasis on teacher evaluation are on the grades of the students. Others involve either administrative and/or peer evaluation. All of this involves OUTCOMES ASSESSMENT. But, there are other factors that probably play and even more important role in teaching effectiveness. Too bad that much money was spent on this “study”. They could have found better and truthful answers by just simply asking good teachers! But what about the people who think no discipline will help students learn! Meanwhile they are a chronic disruption and prevent the REST of the class from learning and yet TEACHERS are held accountable! Bullcrap!! You can fix stupid but not I don’t care!!! And what happens to the teachers whose careers were destroyed by this? If we are society that highly values education, we should have legislators, judges and a president who reflects those values of society. Unfortunately, our public servants in governmental office are greedy and corrupt. Our military spending is obscene and forces out the very kind of spending which would greatly improve family life and foster an educated society. 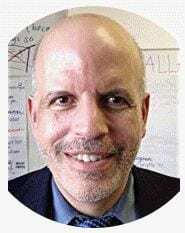 Having done a survey of over 350 high school students in one urban school district, I can tell you that as many as 2/3 may go through the school day without eating a meal — raiding the refrigerator when they get home and then being too exhausted to think about homework; 1/3 don’t have a quiet place to study at home, about half go to bed after midnight on school nights; one third eat dinner alone in their bedrooms; most say that they could find additional time for homework if wished; just about all want to go to college but fail to have any idea of how much effort is needed to earn A and B grades; and finally if they do have parents who ask them if they have any homework the majority lie and say “no”. This includes some students who are frequently allowed to stay home from school to babysit younger siblings or an elderly grandparent, and the kids who unbeknownst to parents skip school even though their parents drop them off at school every morning. I guess I am pleased that the results were published for all of us to read. They spent much money and didn’t get the results they hoped to get, yet they still provided the report for transparency. I agree with you and thank the Gates Foundation for the survey and the honest results as well. People, meaning non-educators, who consider teachers to be less than effective practitioners needed to hear these results in order to move forward to support the critically needed preschool and intervention programs mentioned above. After 17 years of teaching in grades K&1 I can tell you first hand that if kids have love, meals, books, inquiry and productive play opportunities with others, humans that read/play/color/talk to them (whether at home or through a program) prior to entering school our academic gaps would narrow and we could identify and apply intervention far earlier than is currently observed. I would highly encourage the Gates Foundation to fund preschool and early intervention school programs as it moves forward. I see this as a good thing. Now, when folks come after teachers again, there is undeniable research to prove they are facing the wrong direction. Researching a topic, even an annoying and obviously wrong one holds value when the results are published. Pity that so much damage has been done because of these fools. When I first started teaching, department heads needed 10 years of experience. My principal had less than 5 years of classroom experience. Five. We have another with 3 years. They have hidden behind the Gates foundation’s expert data driven methodology to create insane and subjective rubrics for evaluation that can…and is…subverted to control faculty and drive out teachers that present perceived threats to these admins. I’ll give credit to the Gates foundation for its focus on health e.g malaria and AIDS. I was dumbfounded when I started reading about their wrong-headed education initiative. Especially, given Bill’s own private education, which should have been a model to support. So the foundation employed researchers that came to conclusions which were not what the foundation expected. They are publishing the results to help bolster the community and add to dialogue on this important topic. That does not sound like a waste of money or resources. Hopefully, they will now change some of their projects to reflect their research findings. That will bring additional resources to areas they identified as contributing to student success. I see no reason to complain of these actions. So Mr. Bill Gates, what are you going to do to right your wrong?? You have caused a lot of damage to the education of children with your high browed opinions. Listen to teachers on what needs to be done, you and your “experts” really had no clue about public education. Also, Billy Boy Gates, if you had given that money to the teachers salary instead of this asinine “evaluation of teachers” the schools would have been much better off. Too many excellent teachers are leaving because they have to spend too much of their own money on supplies the public education system should be supplying for them. Bet your employees don’t have to pay for their own computers, pencils, paper and other supplies like teachers do. FYI, I am not a teacher, my kids are adults, but I am able to see how horribly teachers are underpaid, Use your millions wisely, instead of trying to prove you know best. I appreciate the fact that they are trying to move the needle forward and that while this effort was not successful, they are not giving up and working on a new effort. Most organizations would not admit their mistakes. Bravo to the Gates Foundation! What about following the highly successful Finnish model. It costs less per student and is infinitely better at student attainment. The model works because Finland is a teeny tiny country, where nearly everyone speaks the same language, is the same ethnicity, practices the same religion, and shares a common culture. Then you take people, like myself, who first became a parent volunteer, and then ended up being an hall moniter. i interact with the students, first before they even get to the classroom. In our school they go threw a security check and then eat breakfast. Many come in the building, already worried about what is going on at home. Being locked out all day, and having to sit on the stoop until their parents get home. They come from broken homes. Drug addicted parents, and are struggling, themselves to want to do better in a world where their is no help or hope. While we need to educate these children, we also have to teach life skills. We need to teach them to love themselves. That they are not their life situation and it is not their fault. How can you expect them to focus in a classroom, when they are worried about their home situation, and they are coming to you first thing in the morning, hungry and broken. It is a different world we live in. Teachers need to be taught to handle our children and all that comes with them in our broken world. i do it everyday. You have to be the family that they do not have most of the time. Once they see how much you care, you will get threw to them. Well said, Joyce. Thank you! Thank you for your sharing your experiences, Joyce. Well stated. I’ve watched a number of great teachers be “Danielson Frameworked” out of their careers. It’s been used to create adversarial work environments a number of times by less that professional administrators who know very little. If there are any non-poisoned teachers OR non-poisoned admins in a system out there, a district will be lucky. Public education has taken a significant wound from this BS. The Danielson assessment does indeed create a hostile work environment. And the public does’t know that only about one quarter of the assessment has anything to do with what actually happens between teachers and students in the classroom. I did well on my Danlielson assessments but saw the writing on the wall and left just the same. I saw teachers all around me dispirited and crushed by this approach, and since I came from the private school sector, I hadn’t been the frog in the slowly-heating water for years leading up to that point. I came on board for three years, saw that our public education has become partisan, authoritarian and hopeless, and went right back to private education as an administrator in a non-hierarchical environment. I now spend my energies making sure my teachers as well as students are supported and happy and I continue teaching myself, which keeps my feet on the ground. And although we welcome students of all income levels and have a disproportionately high percentage of no- or low-tuition students, our outcomes are superior to the highly-ranked public schools in our area. liberal survey failure means the results did not fit the narrative. The survey did not fail. It did exactly what it was intended to do – determine whether teacher evaluation has a positive impact on achievement. I fear this is too little, too late. Many good teachers lost their careers. Many states and local governments invested money in Gates Foundation initiatives instead of programs that might be more effective. We have a multi-million dollar assessment industry that will not go away quietly or quickly ( campaign contributions talk louder than foundations). The ultimate losers were the kids who endured test after meaningless test. Focus more on poverty instead of grilling teachers and offering performance bonuses as if we were sharks on Wallstreet? You don’t say. Years of being made to feel as if every grade was either a career parachute or a landmine, and now they offer a whisper of a mea culpa out the side of their mouth. 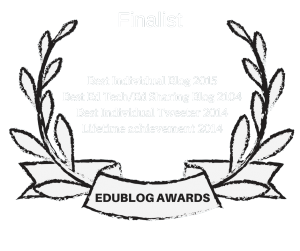 Spend the money on making learning fun and relevant — then you will have a winner! Is “duh” an educated response? Everyone needs to spend time in these schools actually surveying teachers, green and veteran, to get ideas and opinions. They can hand out $20 bucks a survey and save the taxpayers $$ and gain all the information needed. Well, at least they’re willing to admit their mistake, which is a lot better than what’s happening in public school districts where the answer always seems to be to horsewhip the teachers more. May I also humbly suggest that paying teachers well, giving them everything they need to teach and keeping class sizes small (the South Korean private school where I began my teaching career required all classes to be 8-12 students for optimal learning – boy did that work!) and everyone, administration, parents, teachers and students all WORKING TOGETHER toward the common goal of learning (not grades, those have become quite untethered from real learning) might be of help? Teachers already know this!! Kids come to us with so much baggage! A huge waste of $$ judging/evaluating teachers that should have been used for education and updating technology in our schools! After 35 years in school district HR work, trying to work with mathematical evaluation systems designed by outsiders, i hope we return to more human processes- but not by watering down standards. Peer coaching is important; measurement of learning (by instructors- not statisticians) is important, as is progressive discipline- the trilogy of assessing competence in teachers. I loved to use one of my homily questions with teachers “WHAT DO YOU HOPE TO ACCOMPLISH THIS YEAR WITH YOUR STUDENTS- AND WHAT IS YOUR PLAN TO SUCCEED? Human- not robotic. Let’s now listen the NBPTS teachers- not Gates!!!! They need to start listening to teachers. We are the experts. We understand and teach the total child. What an expensive lesson for them to learn! An as elementary educator for 24 years, I’ve seen benefits of pre-school and benefits of allowing parents to accept responsibility for child care. I’ve seen effective and ineffective instructors as well as administrators. We can find research to support anything and manipulate data as we wish. There is no one answer to the numerous issues in education just as there is no longer the “average student”. It would be so refreshing to see action plans and collaboration at work rather than constant research and talk. I’m sure they’re are studies being done about school shootings as well. Wouldn’t it be great to hear someone is taking action rather than talking? As a former department head who had the responsibility of observing and evaluating classroom teachers, I can tell you that I would know within a relatively short time whether or not the teacher being observed had the potential to be an effective educator. I believe that there are two roads that would allow for ultimate success. The most effective, in my opinion, was what I called the intuitive teacher. It begins with their enjoyment about being around their students, coupled with a good background in the subject being taught, followed by their desire to challenge each student to think for themselves. This teacher is very flexible in the method(s) used to accomplish the latter skill(s). The second road would be the teacher that is more mechanical in their approach. They are very organized and follow a process where they dot every I and cross every T. They, too, must enjoy the classroom experience, but their personality is such that thy have to use a more scripted plan. The first question that I always asked the teacher during the evaluation conference was for them to explain to me why they did what they did during the lesson. Their answer told me a great deal. A parent asked me if I knew why the students enjoyed coming to my class. I said that I wasn’t sure (I consider myself an average teacher) to which she responded that I always talked to my students as if they were intelligent and capable of making excellent decisions. Even when they didn’t act responsibly, I admitted that I had not always made the best decisions and that what was important was to learn from our mistakes and to not beat ourselves up. Teaching is both an art and a science. It is not a scripted lesson, and it is not a percentage of students who “mastered” the lessons content. Good teaching is based on relationships and a deep understanding of where our students are in the learning process. I hope school districts and departments of education take this information seriously and change not only the evaluation process but also the connection between teacher evaluation and standardized test scores. Why does it seem so ridiculous to just ask teachers about what the needs are in education? Money would have been better spent in another aspect of education. A link to the report is in the post.